ekreider wrote: Today we received a pleasant change from the usual pizza joint fliers dropped through the mail slot: a menu from Semiramis. Stamped on the back is "WE DELIVER." There is no indication of delivery area. We live in the western part of Lincoln Square, so they are at least going east of the Chicago River. I also found a delivery flyer waiting for me (Ravenswood Manor, a little further west than ekreider). While Semiramis is easy walking distance the uncertainty of the impending storms and my natural laziness paired up well to make me decide to avail myself of delivery. 3 mezze's: green beans with tomato et al, stuffed grape leaves, and tabbouleh. 2 shawerma sandwiches: lamb and beef special and falafel special. Delivery was stated at 35 minutes but showed up in about 20. Complimentary containers of the excellent potato salad were a nice surprise. Minor quibble that some of the liquids had leaked out of their containers into the bottom of the bag and therefore covered the bottoms of all of the food containers. Fortunately Mrs. Kman and I had already changed out of our formalwear and white gloves and, more importantly, there was no impact to the food. Everything was excellent. The beans/oil/garlic/tomato dish was very, very, good - a larger serving of that with some more stuffed grape leaves and lavosh and I could be happy calling that a meal. Both shawermas were also very good. I can actually only attest to my beef and lamb special which I made the mistake of savoring with small bites as by the time I thought to ask Mrs. Kman for a taste of her falafel special it was all gone. No matter, there was still plenty of tabbouleh to try and it was one of the tastier versions I've had in a while with that "everything's so fresh" feeling that good tabbouleh gives you. Thanks for turning me on to this, G Wiv, I'll be exploring the rest of the menu in person as the weather improves but it's nice to have another great delivery option in the neighborhood. I had a quick dinner at Semiramis just now, and it was excellent. Truly excellent. Fine lentil soup. It was thick, with whole lentils visible. It was thickened by some sort of bread, I suspect, maybe chopped up pita or lavosh. I may be wrong, but it certainly looked like a bread. The special lamb+beef shawarma sandwich was amazing. Truly amazing. The only thing I missed was a little bit more browning on the meat to give a crunch to the crust. Otherwise perfect, including the nice fresh lavosh. I also ordered the sumac fries w/toum, which weren't on the menu and caused the waitress/owner(?) to ask how I knew about the fries. The fries were fresh cut and hand cut, which meant there was a fair amount of irregularity. The irregularity is nice, but as a result of it some of the fries were a little overcooked and some a little undercooked. Most were perfect. The toum was much more viscous than what I'm used to -- my preferred style is more, and I hate to compare it, miracle whip like. Light and fluffy and easily spreadable. Since the fries weren't quite crisp it was very hard to dip them into this thicker, gummier toum. Also, I would have been happier if it had a higher garlic content. That being said, the fries were a real winner despite the minor flaws. Arabic coffee with cardamom was strong and fresh and had a big cardamom flavor. It was also a bit chocolatey at times, which was nice. The thick sludge at the bottom of the glass wasn't so nice. Good coffee, though. Soup, fries, and coffee were all $2 each. Sandwich was $5, so with tax it was $12.10, but she gave me $8.90 in change from my $20. I hope she doesn't make a habit of that, because I want the place to stay around! There were 4 tables going when I arrived, but I was alone for the last 10 minutes or so. As I was walking back to my car I saw a group of 6 people waiting outside Noon-o-kebab for their table to be ready. I wanted to tell them to just go down half a block for great food with no wait. Not that noon-o-kebab isn't fantastic, but if I were headed there and found a significant wait for a table, I'd give up and head to semiramis instead. Or vice versa. We too visited Semiramis Thursday night. We plan to be good Chicagoans: We'll order deliver and visit early and often. At those prices, how could we not?! Fresh and sour tabbouleh. The Beef and Lamd Shawerma special was perfect. Tender juicy meat. The touch of sumac. Yum! A whole roasted chicken? For 5.50? With this delicious Garlic sauce? DD ate a good portion - DH and I were pretty stuffed from the appetizers and Shawerma sandwich, but what we had was just lovely. We made little burritos with the lavosh and toum. But all this we knew...the real hit (because that wasn't enough...) The homemade lemonade. Definitely freshly squeezed. Not even close to too sweet. We only wished we had noticed the baklava on the counter when we came in, as we declined dessert. Also, the waitress was VERY nice. THe staff does such a good job. Quick with the food and the clearing. Polite but not intrusive. I think they'll do just fine. Had a special with a name I can't recall. It contained ground lamb and pinenuts surrounded by a bulgar wheat cakelike substance, baked and served with a side of garlic yogurt sauce. I enjoyed the spiced lamb very much, but found the bulgar a little too dry. The sauce was wonderful, though the occasional too-large piece of raw garlic was somewhat unwelcome, even for a garlic lover like me. Baba G, as many have already said, was wonderfully smoky. My favorite item of the meal. Falaffel was perfectly crisp on the outside and not at all dry inside. Very nice. I see many a falaffel in my delivery future. Our waitress was very friendly, and Joseph seemed genuinely interested in making sure everyone had a great experience. It took quite a while to get our orders taken, but all was smooth after that. I liked the simple decor of the dining room, and was expecially fond of the southwest-style design painted/ textured onto the walls. The place was totally packed on this Friday night at 7:30, with a mix of what appeared to be locals and yuppies/ hipsters who probably heard about it at Leo's in Wicker Park. By the time we left at 10, we were the only ones left in the place. Most tables had wine, and the staff seemed to welcome this. One quibble of note: there is a seriously hidded step-up in the middle of the dining room, and I saw 3 people trip over it. Kenny, the dish was baked kibbeh as described earlier by Rich. It's interesting that you describe the design as Southwestern. I think they are going for Arabesque, but you have hit upon the continuum between Moorish, Spanish, Mission and Southwest. On a shoestring budget, the difference is negligible. This thread lead me and my better half to Semiramis for lunch on Sunday. As it turns out, Joseph's daughter, who was working there at the time, and I go way back. His wife was our server, as lovely as ever. Great to know that their family is behind this joint. The food was excellent. I finally get what everyone was saying about the "rolled" sandwiches. I love that, it makes for a better bread to filling ratio for me - as my greedy little stomach is partial to MORE FILLING! We had the chicken and beef and lamb shwarma specials, some fattoush and babaganouj. All delish. The cabbage in the sandwiches was a nice touch. We actually both ate only half of our sandwhiches and saved the other half for later, so as to leave room for ice cream on the way home! 8 hours later we found ourselves making the drive back up north for some korean food and we drove by Semiramis. Happily, they weren't packed, but it was 10pm and there were still tables lingering...I think other people like it there too! Went to Semiramis tonight and the only disappointment was that we were the only table in the place at 7:30. Everything was delicious, grape leaves, baba, falaffel, kabob, and the special which was spinach and lamb; similar to the persian version (the name eludes me), but spiced a little differently. All in all, I think this place is great and will be doing my part to spread the word and keep it in business. I hope others do likewise. I finally made it up to Semiramis for lunch this afternood. I was the only one in the dining room, but they seemed to be doing pretty brisk take out business. I had the fries with sumac and garlic. Way to much for one person, I wish I could have eaten them all. Had a Borak appetizer, which is something I had not tried before. Kind of like a cheese based eggroll, very good. I then had the chicken kafta of which I was only able to eat half. Topped off with a coffee. Great service, reasonable prices, and I was impressed by how clean both the dining room and kitchen were. I have never eaten in the area and cant wait to get back to do some exploring. After being told there was a 2 hour wait at Wholly Frijoles on Tuohy Ave we headed over to 4800 section of Kedzie. The intent was to try Semiraimis and we almost took a detour to Noon-o-Kebab after finally finding parking. Well let me say that the food gods were watching over us. Semiraimis is a clean laid back excellent Middle-Eastern restaurant. When I want a sure Mid-Eastern thing I head over to the Pita-Inn. Most of the middle eastern restaurants I have tried I would only give a so-so rating. (I do remember really enjoying The Nile in Hyde Park). The last internet recommendation was Larsa on Dempster, a huge disappointment. Well, on to the good news. We ordered the Vegeterian platter as an appetizer. Falafel, Baba-ghanoush, Hummous, tabbouleh, stuffed grape leaves and even the spicy pickle garnish...all great. Excellent Lentil soup, seemed to have a lamb base, which is a first for me. The whole chicken with garlic-potato spread accompaniment is an incredible bargain at $5.50. Others at the table had the Lamb with white beans....great flavor ...subtle cinammon spicing and the kebab combo, which unlike many restaurants was juicy and flavorful. I heartily recommend this place and look forward to lunching on one of their sandwiches in the near future. - PERFECT falafil and make sure you ask for some tahini sauce on the side. (5 pieces for a dollar) Perfectly crisp and crunchy on the outside and light redolent with parsley aroma on the inside. Not a hint of grease. - Kefta kabab grilled to perfection and fresh FRESH FRESH meat. Can't wait to try the lamb kabab next time. The 2 spindles of chicken and beef shawerma was absolutely appetizing as well, not a hint of dryness or crustiness. **At both places, service (guys and lady) behind the counter were very friendly, accomodating, and knowledgeable. The cheese borek was so-so, agree with earlier review here, gloried or less than gloried egg roll with mild cheese. Kibbeh was oaky, nothing to write home about. The kefta kabob sandwich was better at Salam Restaurant across the street, which another reviewer mentioned. The harissa was not memorable either. Ordered a chicken for carry out and it is very nice. Wished I had asked for the lavash (bread) on the side, though. I used to love Noon-o-Kabob, which was excellent, but has changed since they went 'corporate' with popularity. I do appreciate suggestions about 'finds/discoveries', smaller and talented enterprises that is every bit as talented if not more so. Thank you everyone. Had yet another very nice meal at Semiramis last evening. We started off with crisp fries dusted with sumac, garlic mousse (toum) on the side. It's been quite a while since I had the ZouZou version, these were even better than I remembered. We, in addition to a combination vegetarian plate w/hummus, baba ghannouj, tabbouleh, falafel and stuffed grape leaves, had Lahm Bahjeem, which was a daily special appetizer. The Lahm Bahjeem, ground spiced lamb baked on pita triangles, had good flavor, but we were there late, got the last one, and the pita suffered a bit. Our friendly, efficient waitress Gloria suggested a squeeze or two of lemon, which brightened the flavor nicely. The whole chicken was, in a word, terrific and maybe the best deal in Chicago at $5.50 for one-whole-chicken w/lavosh and toum. One of the nightly specials was Haroof Meshi, shredded lamb on rice w/pine nuts and almonds, served with a salad. The shredded lamb was tender and extremely flavorful and nicely complimented, both texture and flavor wise, by the pine nuts and almonds. The Haroof Meshi is not exactly photogenic, be assured it tastes better than it looks. We were given, as I'm guessing are many regular customers, a small plate of complimentary desserts. The crisp layered fillo dough was very good. Our meal for 3, including Semiramis's lovely beet colored pickled turnip, olives, pita came to $29.15. And, even given the fact our friend Jan, for a 110-lb woman, can pack it away like Musashimaru, we had leftovers for todays lunch. This past Saturday when my wife returned home from work we walked down to the Walgreen's as their current weekday pharmacy hours of 10 AM - 6 PM mean that those of us that work in offices can't really get medicine except on weekends. Being at Kedzie/Montrose on a Saturday afternoon and feeling peckish we decided to head up to Semirami's for what would be our first ever dining-in experience there (though we have sampled pretty much the whole menu via take-out and delivery). As we approached we noted that the sidewalk chalkboard display of daily specials was headlined by "Pistachio and Sumac Encrusted Salmon Served on Mesculin Greens with Pomegranite Vinagrette". Wow, not one of the entrees I was expecting to find but my wife - a lover of pretty much all things salmon - already knew what she was ordering. We were disappointed to see, at ~2:30 PM, only one other occupied table in the restaurant. We were warmly greeted and quickly brought water and a basket of warm bread (pita? lavosh?) and a bowl of marinated turnip and olives. Our very attractive and personable waitress took our orders - a starter of baba ghanoush, the salmon special for Mrs. Kman and the kefta plate for me. The baba ghanoush was brought out quickly and was descended upon as we were both quite hungry. Without asking the bread basket was replenished - layering a pickled turnip slice in the bread and scooping up the smoky egglplant spread made for a nice combination of flavors and textures. When the entrees were brought out we were both quite impressed with the presentation of the salmon special. It was picture perfect with a sizeable salmon filet fully encrusted as advertised on a lovely selection of greens. When we later commented on how the dish was both pretty and tasty our waitress told us the cook is a culinary school grad and probably temporary so I'll be swinging by often to see if more of these types of dishes are being offered before it's too late. My plate was exactly as ordered, 2 long perfectly grilled oversized cigars of meat with a pile of white rice topped by grilled onion, tomato, and bell pepper. Sorry, no pictures of either plate as we were originally out just to pick up drugs, ummm, I mean visit Walgreen's so didn't pack a camera. If I didn't have such a meat-jones at the time I'd have ordered the salmon and if I see it again I'll definitely have it - Mrs. Kman was full but couldn't stop eating because it was too good. Other than near terminal laziness I can't say why we've never walked the long 4 blocks west to dine in but I'll be checking it out in person more often to see what other novel specialties the kitchen might be turning out. Thanks for bringing Semiramis back to everyone's attention. Everytime I go in, I'm equally dismayed by the empty tables. I've become a broken record with my non-food-obsessed friends: Go to Semiramis! Go to Semiramis! That salmon dish sounds fantastic. I'll be back there soon. I was impressed during a recent visit when, upon ordering the lahm meshwi (charcoal-grilled lamb shewer) sandwich, I was asked how I wished the lamb cooked. Upon hearing my reply ("rare, please"), the waiter nodded approvingly. Very nice attention to detail. I can't remember the last time I was asked that elsewhere for a $5 pita sandwich. We ate there, I think the week after their plug in Chicago Mag, and the place was quite crowded. Most interesting that the mag seemed to have attraced to Semiramis was this very waspish looking pair, with a nice bottle of wine in hands. Anyways, the extra crowd really made it hard for the staff that night. I cannot vouch for the crowds there every Saturday night, but on this Saturday night (the night before Father's Day), it was very crowded. Petit pois and I returned to Semiramis last night for a quick dinner. I noticed that they have changed their hours so that they are now open on Mondays but closed on Sundays. Their menu has also slightly changed. The batinjan moutabbal has been renamed to the more recognizable baba ganouj. Also, the chicken prices have been raised. The whole chicken is now over $7 and a half is over $4, still not a bad deal in any respect. We split an excellent fattoush salad and one Lebanese-style chicken spring roll, crispy and hot from the fryer stuffed with chopped chicken and parsley. Petit Pois had the chicken shwarema over baba ganouj and I had the kefta (kafta? kifta?) entree which was slightly dry, but easily remedied by their hot sauce. The chicken shwarma was the highlght. I really enjoyed the crispy chunks of meat with the smoky baba ganouj. Definitely an entree to return to. eatchicago wrote: Their menu has also slightly changed. The batinjan moutabbal has been renamed to the more recognizable baba ganouj. Also, the chicken prices have been raised. The whole chicken is now over $7 and a half is over $4, still not a bad deal in any respect. Incidentally, has anyone come across another version of the name here in Chicago, abu ghanouj? About the chicken, I find that increase pretty hefty and, while it is true that the old price was absurdly low and the new price is still pretty reasonable, given how tasty their preparation is, one must also bear in mind that the chickens they use are pretty small chickens. 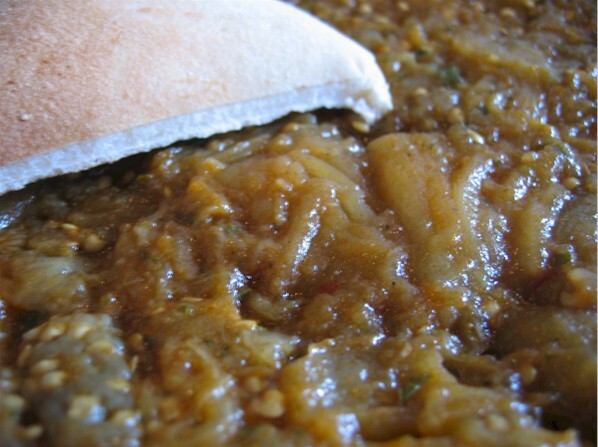 Antonius wrote: Batinjan moutabbal, literally just 'spicy eggplant', is - so far as I know - just another name for what most know as baba ghanouj but I'd like to know what the dialectal distribution of the two names is. In Dubai, the restaurants list mouttabbal and not baba ganouj. A lot of these restaurants are Lebanese run, although that may not be that relevant (to the nomenclature) since the food is "Arabic" fare for the local populace. I don't know if I am on the correct spirit, I have a post to write about Marrakech ExpressO, which I will attach to Erik M's original post. Marrakech ExpressO serves an eggplant salad, which is called Zaalouk in Morocco, but he writes Babaghanouch because that's what we would recognize. Zaalouk is not a puree like Babaghanouch, as you can see it is roughly chopped. Marrakech ExpressO had no taste of smoke, which often indicates either liquid smoke or the eggplant was cooked over fire. I asked how they prepared the eggplant and learned they boil it, then chop and season it. I think by calling it Babaghanouch rather than by its true name Zaalouk, with different preparation, they get disappointed customers. It's better to keep to the true name and educate the customers on a related dish though different preparation. Actually, I wasn't too turned on by this new preparation until I added a touch more salt than the cook intended. “Baba” means "father" and is also used as a term of endearment; “ghanouj” means "indulged." (Thus sayeth Gil Marks in, of all things, “The World of Jewish Cooking”.) I’ve also seen it translated as “old spoiled Daddy,” a not inapt rendering. “Abu” is generally used to denote a holy man or saint from any religion. In street parlance, it is more likely to be used as a slang reference to describe the head of a family or father of children. I am unqualified to respond to a query relating to "dialectical distribution" save to note that “abu ghanouj” is uncommon. As sazerac notes, mouttabal/metabbal/mutabbal/m’tabal (and probably a dozen others) is even more common in the “Middle East." Finally, to complete our lesson: “ghanouj” is not pronounced with a hard “g”; “gh” represents an Arabic consonant that does not exist in English. “Gh” is the most frequent transliteration. To pronounce it, you have to…well, use the “ch” in the Scottish word “loch” as your model. Gypsy Boy wrote: I am unqualified to respond to a query relating to "dialectical distribution" save to note that “abu ghanouj” is uncommon. As sazerac notes, mouttabal/metabbal/mutabbal/m’tabal (and probably a dozen others) is even more common in the “Middle East." Thanks for your reply but I know Arabic fairly well and, beyond Sazerac's helpful indication that batinjan mutabbal is used in Dubai (and your comment thereon; are you saying it is the name throughout the Gulf Arabic dialects? ), I'm still wondering about the dialectal distribution of the various names. For example, is baba ghanouj* the dominant form throughout the entire Levant? what is the going name in Iraq (north and south)? One would guess that Jordan would go along with Palestine and Lebanon but what of (western) Saudi Arabia and easternmost Egypt (Sinai)? And also there remains the original mystery as to why the (I thought) Lebanese owners of Semiramis originally chose to use a less well known name (in this country) for the dish in preference to the here well known name that is used in Lebanon. Lebanon is an ethnically complex place and so one wonders too whether one name is preferred over the other among some groups. The sound in question is a voiced velar fricative, quite similar to the sound spelt «g» in varieties of Dutch (southern, esp. Brabant) and Low German (also Berlinisch) (thus, like the final consonant in Scottish loch and German Bach but crucially with voicing). The sound is, moreover, found in Spanish when «g» stands intervocalically with the following vowel being a non-front vowel (e.g., in pago, cagar, etc.). It used to be in English as well but in the course of the Middle English period was eliminated in one way or another. * The basic meaning of abu in (Classical/Modern Standard) Arabic is 'father', thus the semantic overlap with the affective word baba 'papa, daddy'. Both words have, of course, further meanings, including references to religious figures, in the modern spoken varieties of Arabic. ** A further note: C. Roden gives both names with her recipe but does not comment on where each has currency. A Helou just offers the familiar name, though with a less common and interesting spelling: baba ghanooge, which, while perfectly logical as an indication of pronunciation for English speakers, also looks like the name of a hitherto unknown Frisian island. Last edited by Antonius on September 13th, 2005, 12:12 pm, edited 1 time in total. Let me put in my two cents since I grew up in Lebanon and baba ghannouj (and hummus) were a staple... (i would say we had both 4-5 times a week). On a related topic, i always remember the "burnt" taste in baba ghannouj from years ago back in lebanon... basically the way my grandmother and mother would prepare it is they would put eggplants directly on open fire in the middle of the kitchen and keep turning it until it is cooked. i am able to come close to that taste at home (with a lot of grief from my wife). But at restaurants, i don't get that slight burnt/smokey taste (although the one i had at larsa's a few weeks ago comes close). also, one common way to prepare it was to put a spoon or so or (sour) yogurt balls (or labneh balls that are preserved in olive oil). This makes the baba ghannouj look more whitish and gives it a more sour flavor (really wonderful). I usually put a spoon of plain (not nonfat) yogurt and that comes close. Also, when nowadays with the anti-cholestrol campaign, many of my relatives prepare bab ghannouj without tahini sauce... with just oliveoil/garlic/lemon/salt and pepper. that is also good especially when the eggplant is toasted nicely. ett094 wrote: Let me put in my two cents since I grew up in Lebanon and baba ghannouj (and hummus) were a staple... (i would say we had both 4-5 times a week). Il hamdu li-llaah! Shukran jaziilan! Antonius wrote: Il hamdu li-llaah! Shukran jaziilan! ett094 wrote: But at restaurants, i don't get that slight burnt/smokey taste (although the one i had at larsa's a few weeks ago comes close). also, one common way to prepare it was to put a spoon or so or (sour) yogurt balls (or labneh balls that are preserved in olive oil). This makes the baba ghannouj look more whitish and gives it a more sour flavor (really wonderful). I usually put a spoon of plain (not nonfat) yogurt and that comes close. Also, when nowadays with the anti-cholestrol campaign, many of my relatives prepare bab ghannouj without tahini sauce... with just oliveoil/garlic/lemon/salt and pepper. that is also good especially when the eggplant is toasted nicely. Couple of notes: Some of the restaurants around town do get the smokey element in the dish and, to my mind, that is one of the marks of a good place vs. a not-so-good or boring place. At one and the same restaurant, I've had orders of baba ghanooj that are smokey one time and not smokey another; perhaps issues of who is preparing the eggplant and how much they were in the mood to do their work well. The labneh balls you mention are (as you likely know but for the broader LTH audience) readily available at Al Khyam (Kedzie just south of Al Aurans ( )), as well as at the other Arab groceries further south from there. Sesame paste is fattening, but mercifully has no cholesterol. The fat from the fat-tailed sheep, now that surely has cholesterol! Antonius wrote: Couple of notes: Some of the restaurants around town do get the smokey element in the dish and, to my mind, that is one of the marks of a good place vs. a not-so-good or boring place. At one and the same restaurant, I've had orders of baba ghanooj that are smokey one time and not smokey another; perhaps issues of who is preparing the eggplant and how much they were in the mood to do their work well. I find generally the opposite. Most of the baba ganoush's I eat have a "smokey" element (because more often than not, the eggplants for the dish are cooked on the gas grill--and most Middle-Eastern places have a grill). This is not to discount what Antonius said, both that other places do not have the smokey element and that they are more boring, but as I have mentioned about Chinese food, I am a creature of habit, and I tend to stick with known places (meaning places I know to be good/not boring). Places that I can think of that have this flavor in their eggplant include Steve's Shish Kebab House, Salam, Pita Plus in Lombard, and the place in this thread, Semiramis. true. i usually do it stove-top unless have my weber going) and what i do to minimize the effect of the gas, i do not put the eggplant directly on, but rather i have a tin can cover that i put on the stove and place the eggplant on it.... (this avoids the mess too ) it works ok.
2) Some places have b.g/b.m. in which the smokey element is prominent; at other places the smokey element is absent or in any event insufficiently prominent. 3) Some places have some variation between batches that are more or less smokey; my last take-out order from a place I like on Kedzie was not smokey, though I certainly have had b.g./b.m. there in the past that was. I was a little disappointed. P.S. The one time I was at Steve's, their b.g./b.m. was smokey and very good. By the way, we recently tried to go there and they were closed for vacation. We went instead next door to La Quebrada and had a nice meal. I ordered the cecina (beef) and it was good. Nice tortillas and frijoles de olla too. So, we are saying that we both like a little burn in our baba. All I am saying is that perhaps, in the tight range of Arabic* restaurants I frequent, I've had better luck in finding the kind of eggplant we both like. *Which is more proper as a descriptor, Arabic or Arabian? My best baba ghanouj ever was in a campground in Arkansas, on a long road trip. I picked up an eggplant at the last grocery store where it seemed like we wouldn't see any fresher vegetables in a while (Oklahoma in April? Oklahoma anytime of the year?) much less something so appealing as an eggplant. Arkansas just tells bald-faced lies about their campgrounds. They promise hot and cold running water, ice machines, etc. and you get there and it's a couple outhouses and a standpipe coming up out of the ground. And busloads of Baptists teenagers on "retreat" running through the campground at night. Makes it hard to sleep. But plenty of free wood to gather, nice campfire, eggplant in coals, nice smoky flavor, last of the tahini, good all around. After fleeing Oklahoma, we ended up in meat country (Texas), trapped in a box canyon by tornadoes, but that's another story. And Himself does too, and I think this might be one of those instances where cooking/aging/etc. help mitigate his food allergies. He can eat eggplant that's been really charred. I regularly leave our melons to develop a little mold on the stem end (and by then they've got a really good smell) and they don't bother him as much, then. We generally don't order baba ghanouj out, if it's just the two of us, because the chances of getting a smoky one have been pretty slim.